Description: In 1950 the decision on the beginning of construction of Irkutsk HYDROELECTRIC POWER STATION - the first hydroelectric power station of the Angarsk cascade was accepted. Realization of this project has been assigned to building management Ангаргэсстрой (1946). The author of the courageous and original project of Irkutsk HYDROELECTRIC POWER STATION was G.N.Suhanov. In July, 1956, having dumped in water of 3500 concrete blocks and 35000 m and * 179; gravel, Angara have blocked. In total during construction it has been taken out and moved 38 million in m and * 179; a ground. Directly in a body of a dam отсыпано 7 million in m and * 179; sand and gravel. Into the basis of hydrounit it is hammered nearby 6 thousand т metal armature and it is mounted 8 thousand т металлоконструкций. Length of a dam of 2,5 km, width about 70 m. Capacity 660 thousand in KW. In a building of HYDROELECTRIC POWER STATION 8 hydrounits are established. After filling the Irkutsk water basin the water level is lifted on 30 m from a former level of the river, thus on the average on 1 m the level of all Baikal has risen. In December, 28th, 1956 the Irkutsk HYDROELECTRIC POWER STATION gives the first industrial current. On a designed capacity the Irkutsk HYDROELECTRIC POWER STATION has left in 1959. Presently Irkutsk HYDROELECTRIC POWER STATION in I build, is a component in the Irkutsk power system - "Irkutskenergo", providing with a current the industrial cities of Irkutsk, Angarsk, Shelekhov, Ulan-Ude a landscape of city of Irkutsk, being the present sight of city. In figure of a post envelope the modern kind of a dam with bottom bjefa is presented. 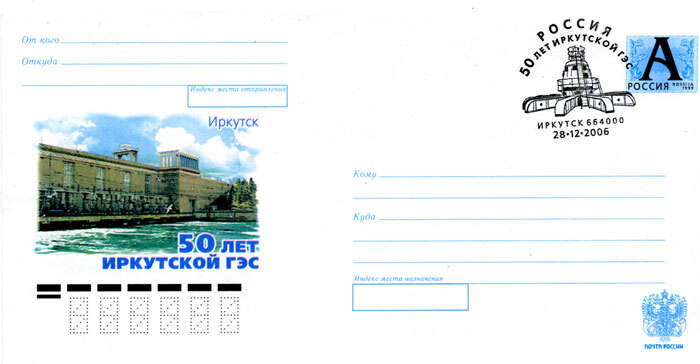 On a special postage stamp - the hydrounit of Irkutsk HYDROELECTRIC POWER STATION. presentation post envelope and its clearing postage stamp took place in December, 11.00 28th, 2006 in a museum in an office building of Irkutsk HYDROELECTRIC POWER STATION. The dam of HYDROELECTRIC POWER STATION is entered in a landscape of city of Irkutsk, being the present sight of city.